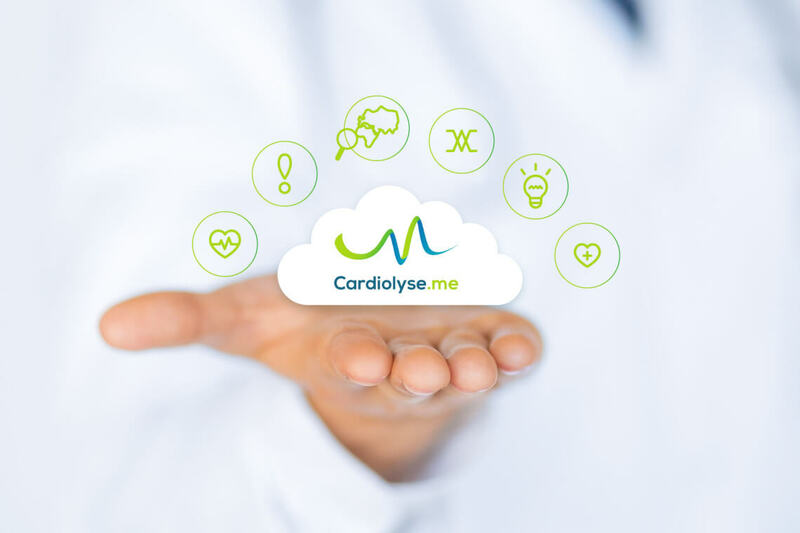 Cardiolyse is a healthcare mobile application. A healthcare mobile application used by a person to connect a cardio appliance to a mobile phone and to record the ECG on the smartphone. Collected data is sent to the patented server, which processes the cardiogram and provides 183 specific parameters, used by a doctor to analyze the health condition of patients and prevent heart attack and other cardiovascular diseases. Our task was to develop a complementary mobile application for an established ECG system. Our application had to blend seamlessly within the current system and yet provide improved mobility. The server itself, which processes the data has already been patented by the creator and developed by the customer in 2014. In 2015 they presented a Windows application, which has been used in actual medical conditions and tested on thousands of patients. Hence we were required to create a mobile application by itself and customize its interaction with the cardio device. 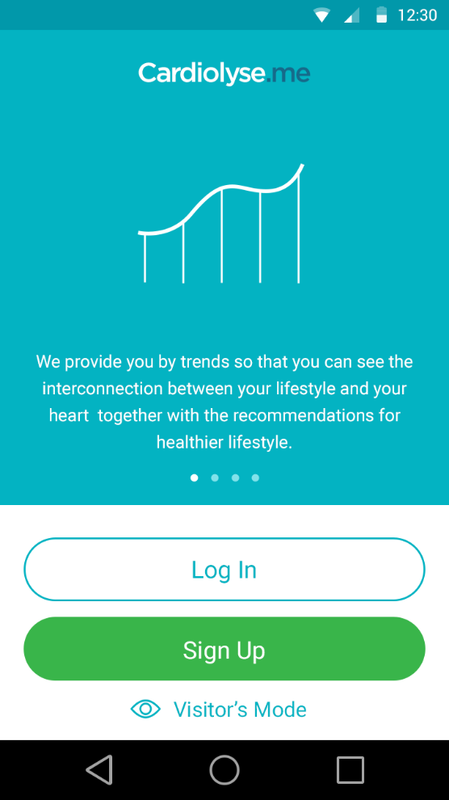 Later, after the mobile application release, the company decided to redirect their business towards sales of the application, which is able to process ECG data from any portable device. It should be noted that the specifics of the application are sufficiently narrow and difficult. In fact, the accuracy of recorded ECG data depends on integration with the device. 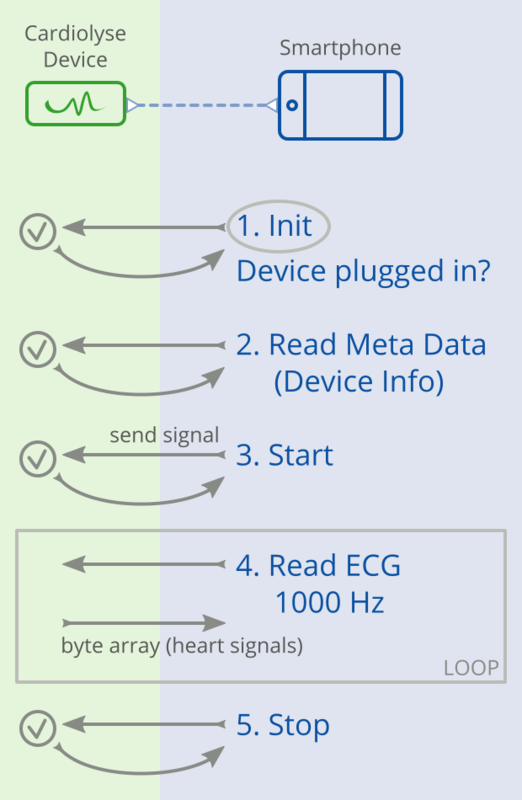 It was complicated to connect the device to the application, namely while setting the starting point of cardiogram since the device records the data continuously and it includes an exclusive firmware that communicates with smartphones through USB OTG. Our developers were working hard on this integration and there were several attempts before success, but they still managed to complete it in time. 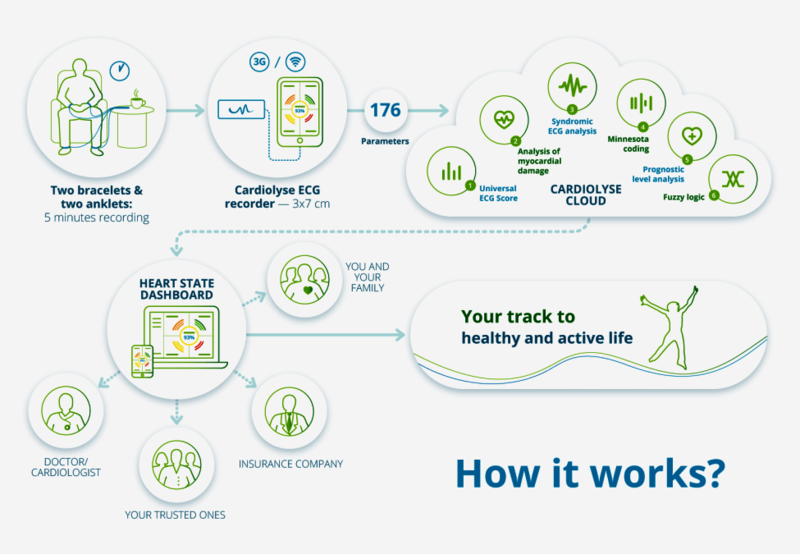 When Cardilyse entered the market with a mobile application and portable cardio device, it turned out that many clinics have been interested more just in the application that will be able to process data from their cardio equipment. 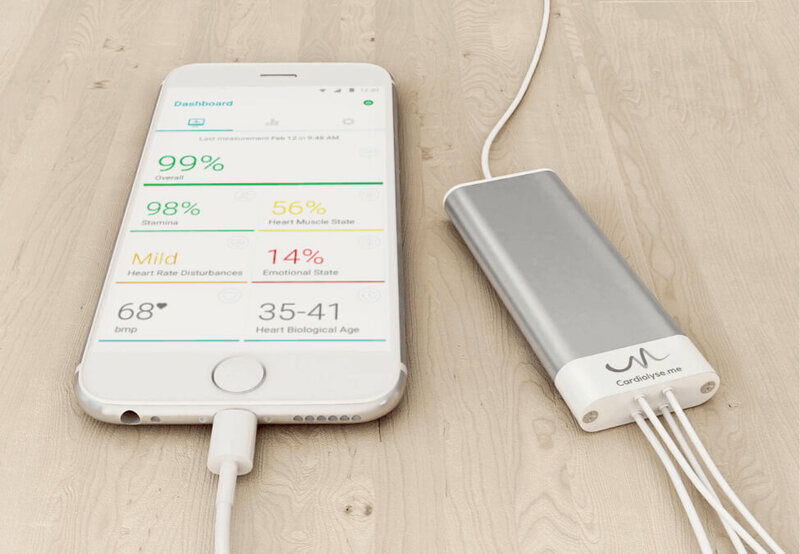 Thus, the company decided to change the course of their business toward sales of the application, which is able to process ECG data from any portable device. This application dramatically accelerates and eases daily health monitoring of thousands of patients, and in case of parameters below norm, it signals for medical help or ambulance. Cardiovascular diseases are sudden guests, unless we are prepared. To be ready we need the health management tools on our personal data. 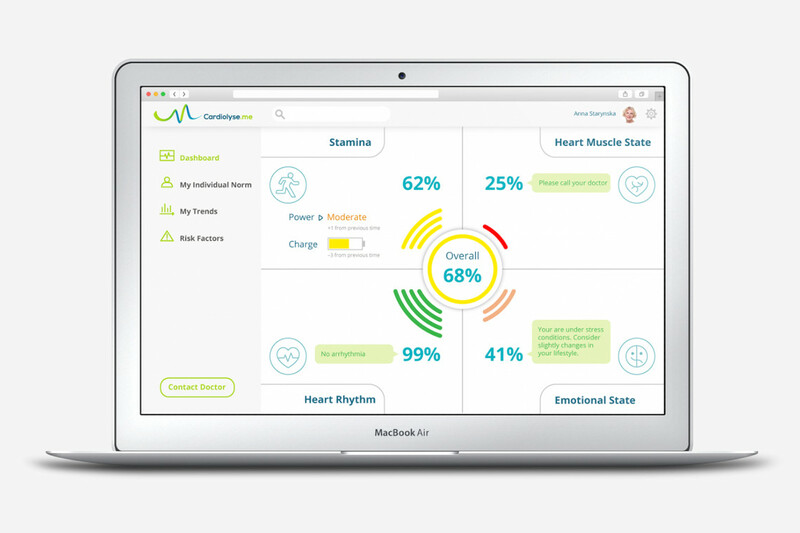 Cardiolyse technology allows you to track how your heart reacts on everyday activities. It is the end of treating people as averages. The healthcare mobile app that was created by our team has become a functional facet for Black box with patented analysis algorithm based on fusy logic. This algorithm was developed by Professor of Cardiology Ilya Tchaikovsky and tested on football players. After regularly monitoring the health of players with the help of this system, the overall level of health of the team improved. 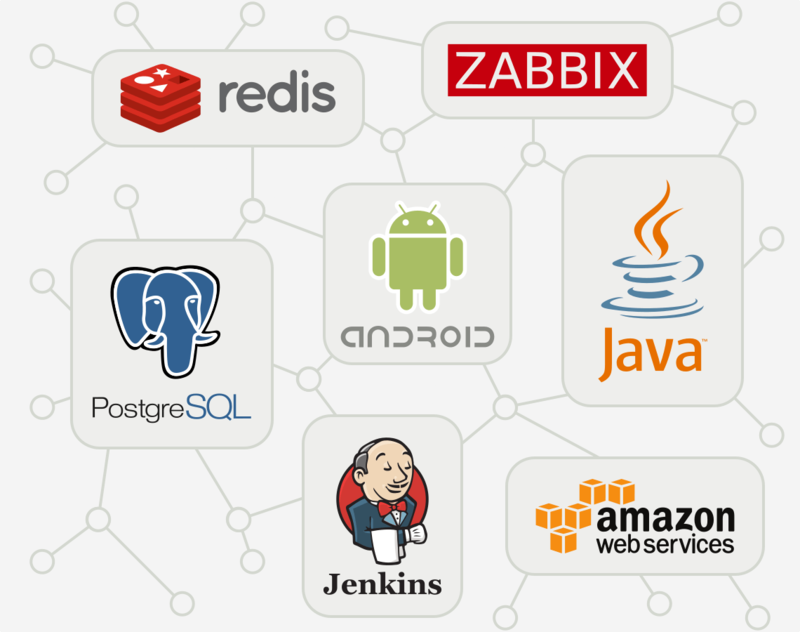 Our task was to create a wrapper on a Unix server using the existing Windows libraries to speed up product release and save the budget of the company. The design was also created by Ardas. The customer provided the mockup (wireframe), which had imposed a bright and functional design. Our designers worked on all the tiny details to make sure that the application meets the modern trends and Google Material Design requirements. We should also note simple and clear graphics which show the history of the recorded cardiograms. The application passed an automatic and manual testing and showed good results, namely cardiograms of patients matched with the parameters issued by the Cardiolyse application.